Nik's QuickShout: Translate Shakespeare 2 Text Lingo 4 Twitter?? If like me you struggle with text and SMS or even Twitter lingo then transL8it will surely be a handy tool for you. 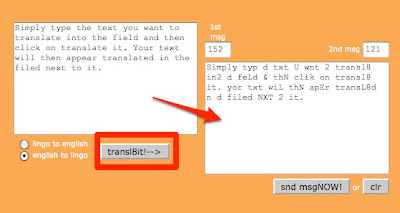 Simply type the text you want to translate into the field and then click on translate it. Your text will then appear translated in the filed next to it. Simply typ d txt U wnt 2 transl8 in2 d feLd & thN clik on transl8 it. yor txt wiL thN apEr transL8d n d filed NXT 2 it. The translation works both ways so you can also feed in text messages and then translate them back to 'standard' English. dat I hav fondly flatterd her withal. I think this is a great tool to use with students to make short texts or dialogue a bit more interesting. You could have them try to figure out the code and rules of translation being applied, then translate some of their own statements. You could prepare some of your own lingo texts for students to translate back. You could translate headlines from the news. This is a fun tool that you can use so easily in so many ways to make dealing with text a bit more entertaining and engaging for students.